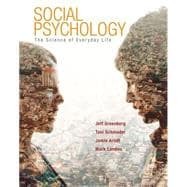 This remarkable new textbook offers a fresh approach to the study of social psychology, integrating theory, research, and applications into a coherent, contemporary portrait of the field that no other available text can match. Social Psychology: The Science of Everyday Life has its own dedicated version of Worth Publishers’ new online course space, LaunchPad. LaunchPad offers acclaimed media content, curated and organized for easy assignability and presented in an intuitive interface that combines power and simplicity. Jeff Greenberg is a Professor of Psychology and College of Science Fellow at the University of Arizona. As a small child growing up in the Bronx, he was very curious about the human propensities for vanity and prejudice. Jeff majored in psychology at the University of Pennsylvania, but it wasn’t until his final semester, and his first course in social psychology, that he found a field where people where asking the questions he thought should be asked. Soon after starting a master’s program in social psychology at Southern Methodist University, he knew this was what he wanted to spend his life studying and teaching. After receiving his M.A., Jeff completed his Ph.D. at University of Kansas in 1982 under the mentorship of Jack Brehm. He has since received numerous research and teaching awards. His research has contributed to understanding self-serving biases, how motivation affects cognition, the effects of ethnic slurs, the role of self-awareness in depression, cognitive dissonance, and how concerns about death contribute to prejudice, self-esteem striving, and many other aspects of social behavior. Jeff has also co-authored or co-edited six prior books, including the Handbook of Experimental Existential Psychology and In the Wake of 9/11: The Psychology of Terror. Toni Schmader is a Canada Research Chair in Social Psychology at the University of British Columbia. She received her B.A. from Washington &amp; Jefferson College in Pennsylvania before completing her Ph.D. at the University of California, Santa Barbara. Before moving to Canada in 2009, she taught at the University of Arizona for 10 years. At UBC, she was awarded the Killam Prize for excellence in research, and at the U of A she received the Magellan Prize for excellence in teaching. She is currently a member of the executive committee of the Society for Personality and Social Psychology and an Associate Editor at the Journal of Personality and Social Psychology. She was drawn to research in social psychology for its ability to take a systematic empirical approach to examining important social issues and to teaching for the opportunity to share those insights with others. Her research examines how individuals are affected by and cope with tarnished identities and negative stereotypes. She has published work on topics of social identity threat, stigma and identity, stereotyping and prejudice, self-conscious emotion, and gender roles. Jamie Arndt is the 2012 Frederick A. Middlebush Professor of Psychological Sciences at the University of Missouri (MU). After attending Skidmore College in the eastern United States for his B.A., and the University of Arizona in the west for his Ph.D., he settled in the middle, accepting a position at MU in 1999. During his time at MU he has received the Robert S. Daniel Junior Faculty Teaching Award, the Provost’s Junior Faculty Teaching Award, the International Society for Self and Identity Early Career Award, and the University of Missouri Chancellor’s Award for Outstanding Research and Creative Activity in the Social and Behavioral Sciences. He is a founding member of the Social Personality and Health Network, former Chair of the Society for Personality and Social Psychology Training Committee, and has served on the editorial board of various journals in the field. He has authored or co-authored scholarly works pertaining to the self, existential motivation, psychological defense, and their implications for many topics, most notably health decision making, creativity, and legal judgment. Mark J. Landau is an Associate Professor of Psychology at the University of Kansas. Mark received his B.A. from Skidmore College, where he became very interested in the fusion of experimental psychology and existential philosophy. He continued his research and education at the University of Colorado, Colorado Springs, and then the University of Arizona, where he received his Ph.D. in 2007. His research explores how existential motives influence social perceptions and behavior, and how people use conceptual metaphors to construct meaning. He has received a number of awards recognizing his research, including the Theoretical Innovation Prize from the Society for Personality and Social Psychology and the Outstanding Early Career Award from the International Society for Self and Identity. Mark has taught social psychology for over 14 years. He enjoys showing students that research, much like an inspiring novel or movie, affirms our common humanity “reminds us that we are not alone in our strivings, insecurities, and foibles” and thereby sharpens our ethical awareness.